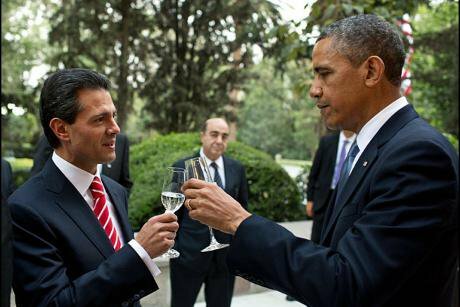 Here's to you: Barack Obama shares a toast with his Mexican counterpart, Enrique Peña Nieto, before a working dinner in Mexico City in May 2013. Wikimedia / White House. Public domain. There is little doubt that the Venezuelan president, Nicolas Maduro, has been responsible for a crackdown on political opposition and decreeing additional powers that have increased state control of the country. But if the Obama administration is so concerned with violence against political dissent and injustice inflicted on the population by a corrupt government, how is it that Mexico, its neighbour country, does not represent a similar threat? According to President Obama, the Venezuelan government’s “erosion of human-rights guarantees … constitutes an unusual and extraordinary threat to the national security and foreign policy of the United States”. Yet Mexico, where more than 100,000 have been killed and over 22,000 have disappeared since the start of the ‘war on drugs’, does not seem to constitute such a national emergency. How is it that a country where, according to the UN special rapporteur on torture, Juan Méndez, “torture and ill treatment during detention are generalised … and occur in a context of impunity” does not raise the same alarm in Washington? The US and its allies are quick to condemn the corruption in Venezuela when, just south of its border, 43 students in Ayotzinapa were carried off by security forces and handed over to criminal groups who specialise in torturing, mutilating, and beheading those who oppose them. The US has spent at least $2.35 billion on security assistance to Mexico under the Plan Merida, which is supposed to curb drug trafficking and organised crime. Mexico’s security services receive US financing, training and armament, at the same time acting with impunity and committing hundreds of human-rights violations which go unpunished—as Amnesty International and other human-rights organisations around the world have brought to light. The White House says the new sanctions will target a finite number of Venezuelan officials, not the wider public or trade relations. But in a country with a rising crime rate, a slumping economy and a crisis which has left basic goods and services in short supply, the enmity between the US and the Venezuelan government will most certainly hit an already suffering population the hardest. The measures by the US only serve to give Maduro an excuse to exploit the conflict to enhance his already-growing powers and reiterate his claim of a ‘Yankee imperialist’ agenda. Indeed, the Venezuelan parliament has just approved ‘anti-imperialist’ laws, which will enable Maduro to rule by decree for the next nine months. Whatever about elevated institutionalised corruption, impunity, human-rights violations, crime and murder, It would appear that the main difference between Mexico and Venezuela is that, while Mexico is willing to do almost whatever the White House dictates, Venezuela does not co-operate so readily. The US is evidently unhappy with Maduro’s presidency, especially Venezuela’s role in the coming to power of the ‘Bolivarian socialist governments’ of South America publicly opposed to ‘imperialist US interests’. The new sanctions and, especially, declaring a national emergency to deal with the threat only serve to confirm this view among Obama’s Latin American detractors. It seems that corruption and human-rights violations only represent a threat to US national security when the government in questions is not a political and commercial ally of the US. Applying such double standards only shows that the main concern of the US lies in implementing its political and economic agenda and imposing its will worldwide. It is a worrying precedent, spanning not only US-Venezuela relations but with implications for how a human-rights crisis comes to be defined worldwide, and by whom.